NGC 7662 is a planetary nebula located in the constellation of Andromeda. A planetary nebula develops from a star that is in it's later stages of evolution. As the star runs out of hydrogen to fuel itself, it begins blowing off shells of gas. These hot expanding gases will glow, commonly emitting light from Oxygen (Oiii) and Hydrogen (Ha and Hb). 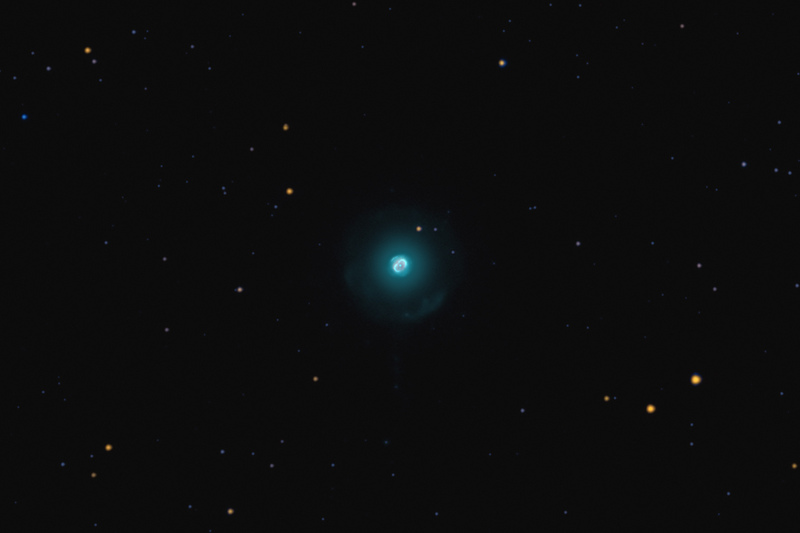 The Blue Snowball nebula is dominated by the blue green light from Oiii, although the inner core of the nebula contains a fair amount of red light from Ha emissions. NGC 7662 has an extraordinary range of brightness, making it difficult to capture all aspects of the nebula. The inner core is quite bright and is easy to see in amateur telescopes. However, the bright core is surrounded by an extremely faint halo and an even fainter jet. To bring out these features, I captured a wide range of exposures and employed some selective techniques to display the tremendous dynamic range of this beautiful target. In this image, North is to the right. This image was drizzled to 2 times it's original size, and then cropped to 17% of the original full frame. Software Used Images Plus 6.0 and Sequence Generator Pro 2.6 for camera control. Plate Solve 2 for plate solving. Images Plus 6.5 for calibration, stacking, ArcSinH stretching, adaptive Lucy-Richardson deconvolution, Feature Mask, and star size reduction. Photoshop CS5 used for levels and curves, lab color, saturation adjustments, selective color, and match color. Gradient Xterminator for gradient removal. Carboni Tools for additional noise reduction and smoothing. HLVG for additional color correction. Registar 64 for subexposure alignment. Focus Magic for focus restoration. Pixinsight 2.8 for drizzle integration. Notes This was an extremely challenging target to capture due to it's very small angular size and huge dynamic range. The bright core of this planetary nebula is only about 1/2 arc minutes across. My 600mm lens is less than ideal for capturing such a small object and it's fine details. Nonetheless, I was determined to push my equipment and skills to the limit. Although there are certainly more detailed images of this nebula, I was very pleased with how well I did with my far from optimal equipment. The extended halo is only about 2 1/2 minutes across. Although somewhat noisy, I was very happy to have captured this halo and even more pleased to capture the faint jet. Although there are probably more, I was only able to find 3 images that displayed the halo and jet! This image was published by Astronomy Magazine as its Picture of the Day for March 5, 2018!